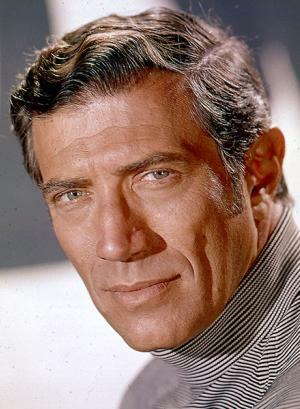 Joseph Campanella (born November 21, 1924)[an American character actor who has appeared in more than two hundred television and film roles since 1955. 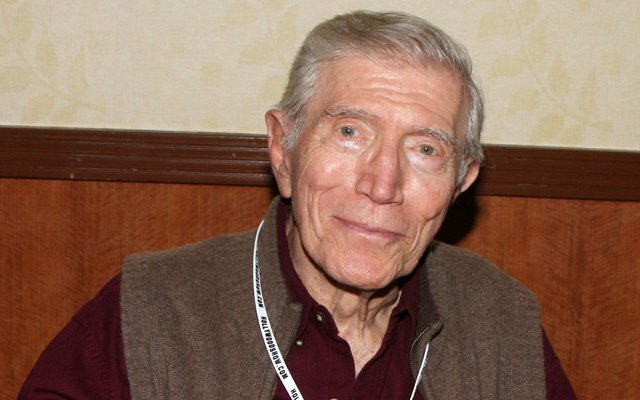 His television appearances include such shows as Decoy, The Eleventh Hour, The Fugitive, Mission: Impossible, Gunsmoke, The Big Valley, Alias Smith and Jones , The Untouchables, Police Story, The Road West, The Invaders, The Mary Tyler Moore Show, The Golden Girls, and Mama's Family. He had a recurring role from 1959 to 1962 as a criminal named Joe Turino on the long-running CBS daytime drama The Guiding Light. He had a role in 1967 as Lew Wickersham in the television series Mannix as Joe Mannix's boss and friend, before the P.I. went solo and started his own firm. Campanella appeared as attorney Brian Darrell from 1969 to 1972 in The Bold Ones: The Lawyers. Campanella played Los Angeles County Sheriff's Department Captain Monty Ballard in the crime drama TV movie "Sky Heist" in 1975. 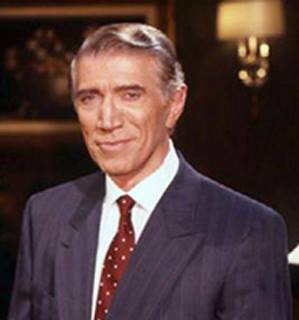 He played Ann Romano's ex-husband, Ed Cooper, in eight episodes of One Day at a Time (1975–1984) and Barbara Stanwyck's love interest in the first season (1985–1986) of the Aaron Spelling's short-lived Dynasty spinoff, The Colbys. He also appeared in a second season episode of The Golden Girls as a detective. The actor had a prominent role as Harper Deveraux on the soap opera Days of Our Lives from 1987 to 1988 and from 1990 to 1992, and a recurring role on The Bold and the Beautiful from 1996 to 2005. 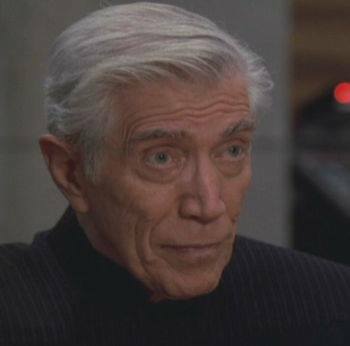 He made one of his final performances as a Federation Arbitrator on Earth in Voyager’s “Author, Author” He appeared in the CBSRMT episode "Murder to Perfection"
Spoiler : Joseph Anthony Campanella (born November 21, 1924) is an American character actor who was gaunt, wavy-haired Sicilian-American character actor who seemed to pop up in just about every second TV series and telemovie of the 1960s and 70s. He appeared in such television shows as Combat, Decoy, The Eleventh Hour, The Doctors (1963), The Fugitive, Mission: Impossible, Marcus Welby, M.D., Gunsmoke, The Big Valley, Alias Smith and Jones, The Untouchables, Police Story, The Road West, The Invaders, The Mary Tyler Moore Show, Rockford Files, The Golden Girls, and Mama's Family. Spoiler : He played the Arbitrator in the Star Trek: Voyager episode "Author, Author". Spoiler : As narrator, he provided the voice for National Geographic specials (for each episode some eight hours of voice-over were taped, though only fifty minutes were actually used), as well as doing commercials for BMW and the National Automotive Parts Association. On Broadway his roles have included "Captain and the Kings," "Hot Spot," "Born Yesterday," and "The Caine Mutiny". Spoiler : He had a recurring role from 1959-62 as a criminal named Joe Turino on the long-running CBS daytime drama The Guiding Light. He had a role in 1967 as Lew Wickersham in the television series Mannix as Joe Mannix's boss and friend, before the PI started his own firm. Campanella appeared as attorney Brian Darrell from 1969-72 in The Bold Ones: The Lawyers. Campanella played Los Angeles County Sheriff's Department Captain Monty Ballard in the crime drama TV movie Sky Heist in 1975. Spoiler : He played Ann Romano's ex-husband, Ed Cooper, in eight episodes of One Day at a Time (1975–1984) and Barbara Stanwyck's love interest in the first season (1985–1986) of Aaron Spelling's short-lived Dynasty spinoff, The Colbys. He appeared in a second-season episode of The Golden Girls as a detective and a seventh-season episode of "Star Trek: Voyager." He had a prominent role as Harper Deveraux on the soap opera Days of Our Lives from 1987 to 1988, had a recurring role as a doctor in "Beauty and the Beast" (1989-1990), and a recurring role on The Bold and the Beautiful from 1996 to 2005. Campanella voiced the character of Dr. Curt Connors/The Lizard on Spider-Man: The Animated Series (1994–97). He narrated the Discover science series on the Disney Channel from 1992-94. Spoiler : He appeared in 1 episode of Radio Mystery Theater. Spoiler : (Joseph Mario Campanella) Born in New York City 11/21/1927. Screen debut in Murder Inc. (1961). Joe Turino on CBS-TV soap The Guiding Light (?-?). Doctor Ted Steffen on The Nurses for CBS-TV (1964-1965). Alec Fielding on the NBC-TV soap, The Doctors (1964-1967). Narrator for many National Geographic Specials on CBS-TV (1964- 1973). Lou Wickersham on Mannix for CBS-TV (1967-1968). Narrator of CBS-TV news special The Making Of The President: 1968 (1969). Brian Darrell on The Lawyers for NBC-TV (1969-1972). Guest star on radio programs including The Zero Hour for Mutual (1973-1974) and The CBS Radio Mystery Theater during the middle 70's Ed Cooper (Ann's ex-husband) on One Day At A Time for CBS-TV (1975- 1984). Narrator for The Undersea World Of Jacques Cousteau for ABC-TV (1976). Host of the syndicated television series of, This Is Your Life (1983). Hutch Corrigan on The Colbys for ABC-TV (1985-1986). Senator Harper Deveraux on the NBC-TV soap, Days Of Our Lives during the 1980's. Host of the syndicated tele- vision series, Emergency Call (1991-1992).